Three out of four homeowners born before 1961 are confident they will have a financially comfortable retirement according to the Freddie Mac 55+ Survey, a comprehensive survey of the housing perceptions and preferences of Americans over the age of 55. The first Freddie Mac 55+ Survey also found that the majority of homeowners in this age group were very satisfied with their homes, their communities and their quality of life. Consistent majorities also said homeownership makes financial sense at almost every stage of adult life, whether or not a person is married or has children. “The overwhelming message of the Freddie Mac 55+ Survey is that homeownership works. The American Dream delivered greater financial stability and satisfaction to the homeowners who lived through every recession since the 1970s, including the housing crisis of 2008,” says Dave Lowman, executive vice president of Single-Family Business at Freddie Mac. In addition, while many over the age of 55 would prefer to age in their current home, nearly 40 percent said they would prefer to move at least one more time, and 70 percent of those said they are likely to purchase their next home. According to Lowman, this will create significant opportunities and challenges for the industry for years to come. 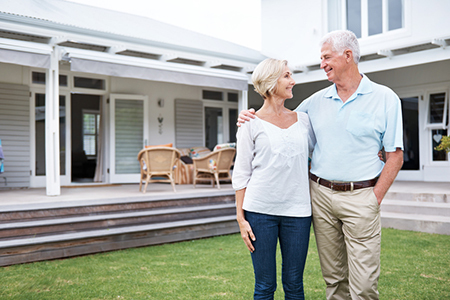 Overall, 76 percent of homeowners over the age of 55 are confident they will have a financially comfortable retirement, according to the Freddie Mac 55+ Survey. Majorities in every demographic group surveyed share this confidence to varying degrees: African-Americans (77 percent), Hispanics (64 percent), Asians (80 percent), homeowners who are currently working (74 percent), as well as homeowners earning less than $30,000 (55 percent). The Freddie Mac 55+ Survey also shows consistently strong links between homeownership and a person’s satisfaction with their home, community and financial situations. Specifically, 59 percent of homeowners are “very satisfied” with their communities, 64 percent with their current home, and 54 percent with their quality of life. A majority also believe homeownership makes financial sense for most Americans. Specifically, 96 percent feel homeownership makes financial sense for people who are either married with children or between 35-49 years of age. Smaller majorities said homeownership makes sense for people over 55 (87 percent), married couples without children (85 percent), single people with children (79 percent), and single people without children (53 percent). In terms of helping others become homeowners, nearly 25 percent of the respondents say they have already helped someone financially with a down payment. This entry was posted in Buyer Info, Home Ownership, Seller Info and tagged Hampton Roads, homes, Marketing, Mortgage Rates, RE/MAX, Real Estate, Virginia Beach by remaxalliancevb. Bookmark the permalink.